In an enchanting and private location hidden by deciduous trees , L’Antico Mulino is a traditional stone house originally built for the miller as his home, which has been in the owners’ family for generations. 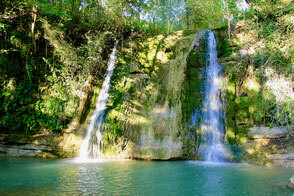 It is in a very quiet and peaceful spot, with no neighbours, beside the Tescio river. 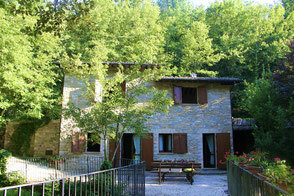 The place is situated no more than a 15 minute drive from the beautiful little medieval town of Assisi, surrounded by woods in the idyllic natural environment of the Monte Subasio National Park. The house, dating back to the 18th century, was fully restored in 1999, using traditional materials and methods of craftsmanship. It sits above the old grain watermill that belongs to the property (there are large, shallow steps to reach this), which has now been converted into a relaxation room (unheated) where you can meditate and read in total peace of mind listening to the sound of the waterfall outside. More steps lead down to the natural pool at the foot of the waterfall – a heavenly, sunny spot filled with butterflies, damselflies and dragonflies, and the shallows of the river at night are alive with little crayfish and frogs. authentically in keeping with the property former life as a grain mill. L' Antico Mulino it's only 7.5 km from Assisi. History ,art and spirituality are the essence of this beautiful village where time seems to have stood still. 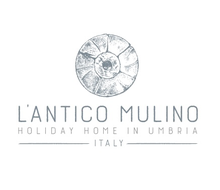 Find out about rates, offers and availability by contacting us via email at info@anticomulinoassisi.com .